Reclaim The Records‘ first FOIL request, our pilot project, was an attempt to get access under the New York State Freedom of Information Law (FOIL) to the index to some old marriage documents that were stored only in the New York City Municipal Archives in lower Manhattan. 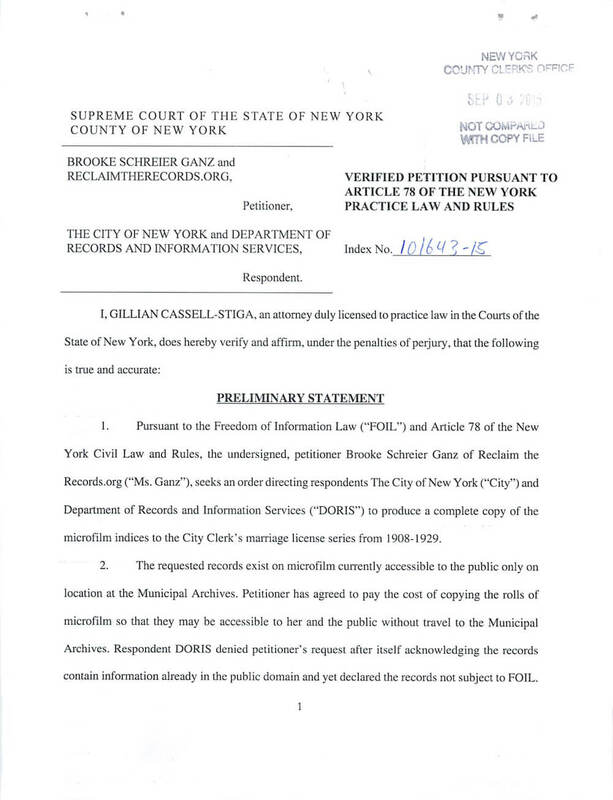 There are two sets of marriage-related records kept on-site at the NYC Municipal Archives. The better-known is the late 1800’s-1937 marriage certificates, originally kept by the NYC Health Department. There are two indices to this record collection, commonly called the “Brides Index” and Grooms Index”, to help you find the right document. Both the certificates and its indices are available on FamilySearch microfilm. They have also been transcribed and turned into a free searchable database through a volunteer-run project organized by non-profit genealogy groups. That volunteer-created transcribed database was also recently added to Ancestry.com. If you’ve ever ordered a copy of your family’s New York City marriage certificate, this is almost certainly what you got: a brief two-page document from this Health Department record series. But our FOIL request was not about those certificates. Instead, we were trying to get public access to the index to a much lesser-known but very important record set. This set was originally kept by the New York City Clerk’s Office, and it is the 1908-1929 application, affidavit, and license for a marriage, a totally separate three-page document that is generally dated a few weeks before the actual marriage took place. Why is this 1908-1929 “Application, Affidavit, and License” record group so useful to genealogists and researchers? Several reasons! We’re glad you asked. And perhaps most importantly, this document usually has three different sets of handwriting in it! This certainly helps researchers who have had to deal with records that were semi-illegible or perhaps had “creative” spellings of names and places. And here’s the thing: you can already order these three-page documents from the NYC Municipal Archives. But neither the documents, nor the indices to the documents, were available anywhere else but on-site at 31 Chambers Street in lower Manhattan. They weren’t scanned, they weren’t online, they weren’t transcribed, and they’re not on FamilySearch microfilm. They’re public documents, and yet the public didn’t have its own copy. Our FOIL request, and our eventual Legal Petition, was seeking access to just the index to this record set, which exists on 48 microfilms. We weren’t seeking access to the full three-page records, which would have been hundreds of microfilms. We just wanted a way to make it easier to see what even exists in that record set in the first place, so that the records could be more easily usable by the public, who may not be able to travel in person to Manhattan to do their own look-ups. 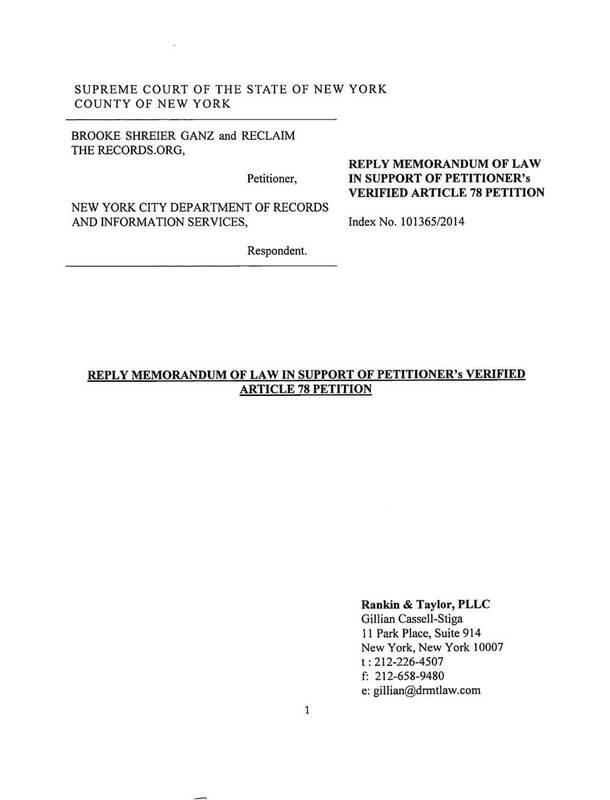 Technically, we filed an “Article 78” Legal Petition; ReclaimTheRecords.org was the Petitioner, not a Plaintiff. This Petition sought to have a judge rule on the propriety of withholding these records from the public under the Freedom of Information Law, whereas a suit would be seeking damages. We would have greatly preferred that the NYC Municipal Archives agree to our FOIL request in the first place, which would have avoided all this hassle. And indeed, they did initially agree to our request — on official letterhead! But then suddenly, for unknown reasons, they backtracked and withdrew their agreement. And then they denied our FOIL appeal. And then they ignored the Advisory Opinion from the New York State Committee on Open Government. So we had to do the whole lawyer thing. We filed our legal petition in the Supreme Court of the State of New York, County of New York (Manhattan) on September 4, 2015. The city was supposed to answer our case in court on Friday, September 25th, but instead they came to our attorneys on Monday, September 21st to work out a settlement, which was entirely in our favor. We got every microfilm we wanted. We’re currently working on getting the city to reimburse our attorneys fees, which is allowed under New York State’s FOIL in cases where a government agency basically had no legitimate reason to have denied a citizen’s records request. We won’t know if we also won the fees until closer to the summer of 2016. In practice, awarding attorneys fees in FOIL cases is more commonly awarded in areas of New York State outside of New York City. We’d put our odds at fifty-fifty. 46 of the 48 microfilms we requested arrived at our doorstep by registered mail on Wednesday, October 14th, 2015. The other two films had to be retrieved from a different city vault for copying and they arrived in late January 2016. The very generous people at the non-profit group FamilySearch scanned all of the films for us in February and March 2016, for free, on their professional-grade scanning equipment, and then they mailed us back all the microfilms and a new portable hard drive full of all the newly-digitized images. Thanks, FamilySearch! Then we uploaded the images to the non-profit and extremely awesome Internet Archive (archive.org) in April 2016. By April 15, 2016, 44 out of the 48 microfilms were online for free use, and the last four films went online shortly thereafter. What happened to the original microfilms you won? 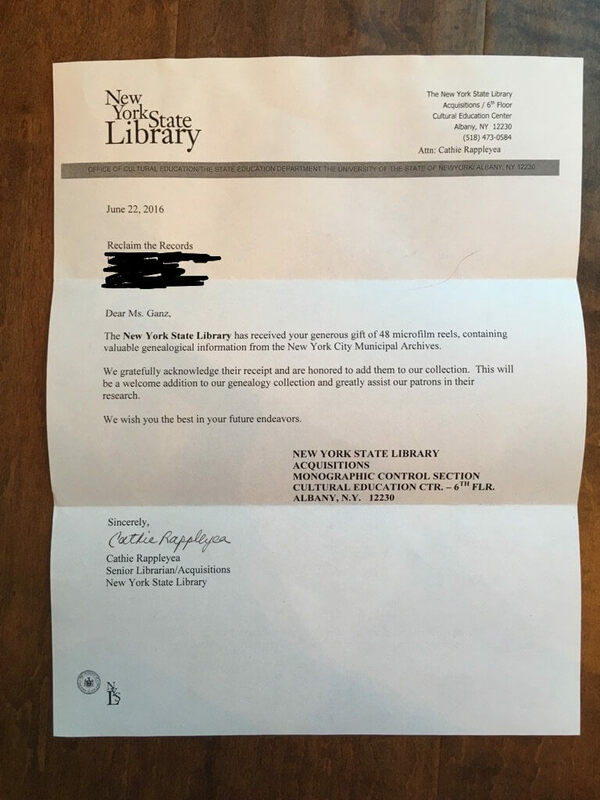 Once all the scanning and uploading was completed, we donated the 48 microfilms to the New York State Library in Albany in June 2016. Check out the thank you letter we received in the sidebar. Will other websites post these images too? We hope so, but that’s totally up to them. Yes, the for-profit genealogical companies will be also allowed to post these images to their own websites, if they want to do that. We hope they’ll choose to keep them freely available, not paywalled, but that’s up to them. Yes, non-profit groups and individual researchers can use and re-post these images too. The data is totally in the public domain, and the important thing is that this information is now online, for free, for everyone. Are you going to lead an indexing and transcription project? We really do hope that someone will turn the scanned images of this index into a transcribed and searchable database, to make life easier for researchers. But we’re leaving that entirely up to the genealogical community to figure out the details; we’re just interested in posting the data online and then moving on to our next batch of records requests. If one of the genealogical non-profit organizations or for-profit companies want to take that project on, that’s entirely up to them. We hope to have more details about this soon. 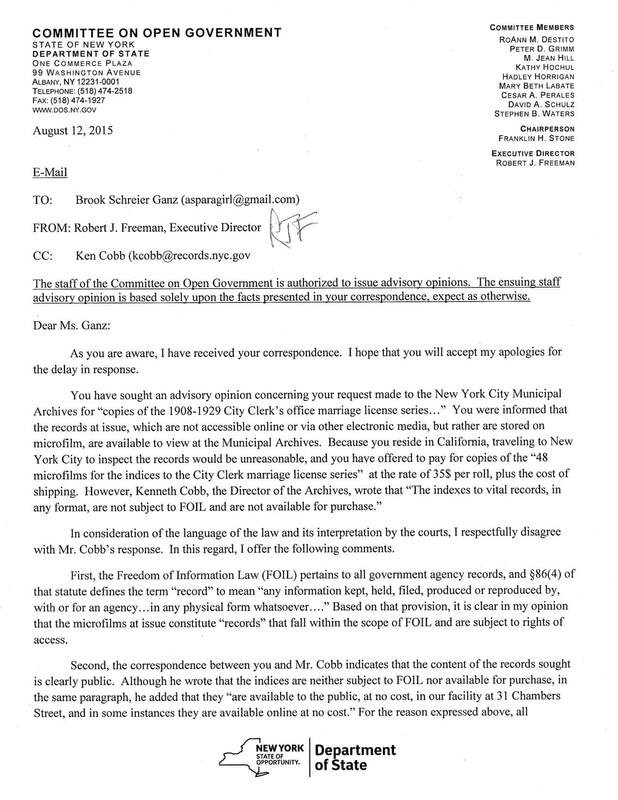 The New York State Committee on Open Government (COOG) wrote an Advisory Opinion about our FOIL request against the New York City Municipal Archives -- in our favor. Issued August 12, 2015. These 46 microfilms -- brand new and created from the master copies in the city vault -- arrived in California on October 14, 2015.